This week is the global week of action for tax justice and on Wednesday 5th April activists from the Tax Justice Network and Methodists for Tax Justice held a protest outside the London offices of Price Waterhouse Coopers. The global week of action for tax justice is happening one year after the release of the Panama Papers. The Panama Papers were the latest in a series of large leaks from the offshore world that have revealed the true extent to which lawyers, bankers and accountants have facilitated the hiding of vast amounts of money in offshore financial centres by individuals and companies. One year on, these facilitators of financial impropriety have suffered few consequences and continue to operate with impunity. Over the past few years PwC has revealed itself to be a particularly big player in the world of tax avoidance. The Luxleaks scandal showed the company to be providers of tax avoidance schemes to large firms on an industrial scale. PwC was working with the Luxembourg tax office, and one tax officer there in particular to sign off hundreds of deals with multinational companies allowing them to transfer billions into the country virtually tax free, depleting the resources for public services in other countries. The company’s reaction to this was appalling. Rather than accept that they’d seriously lost their way in terms of its ethics and wider professional obligations, it proceeded to track down and bully the whistleblowers who had revealed its own poor behaviour. In particular, the company compelled one former employee Raphael Halet, under duress, to sign a non-disclosure agreement which he believed, wrongly as it turned out, prevented him from entering a defence in a later criminal trial. 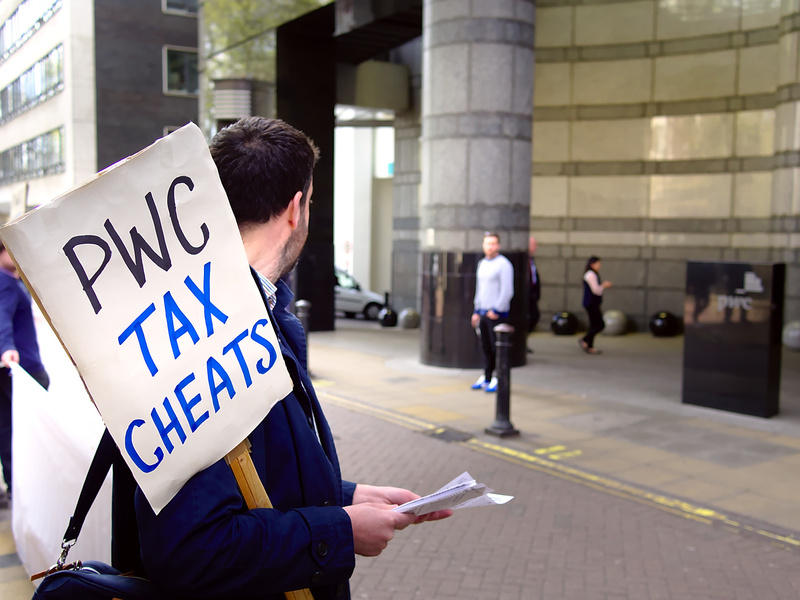 “The committee received evidence from a former senior PwC employee stating that within the firm the policy was that it would sell a tax avoidance scheme which had only a 25% chance of withstanding a legal challenge. As the committee chairperson put it “you are offering schemes to your clients – knowingly marketing these schemes – where you have judged there is a 75% risk of it then being deemed unlawful”. 11,000 people in the UK lost their jobs when the company BHS collapsed leaving pensioners afraid for their future because of a giant hole in its pension fund. The industry regulator is asking questions over how PwC signed off the company as a going concern just days before being offloaded for £1 to a former bankrupt with no retail experience. Shares in Tesco, one of the UK’s best known retailers plummeted in September 2014 when it revealed that it had mis-stated its profits by, erm, £250 million. PwC, the company’s accountants, are currently being investigated by the industry regulator over their role in the affair. British Telecom is seeking to drop PwC, their auditor for 30 years after they discovered an accounting scandal in their Italian division which forced the company to write down £530 million and sent shares crashing, wiping off £8 billion of the value of the company. With such an inglorious record it’s a wonder how the company continues to operate. But the big audit firms have such a stranglehold on the market that customers are left with little choice. It’s time for the government to take action and break up the big four accountancy firms, and properly regulate the industry. Even Ecology Building Society, a member of the Fair Tax Movement uses one of the Big Four. When I asked them about this they said they were compelled to do so by the Bank of England. Is this really so?